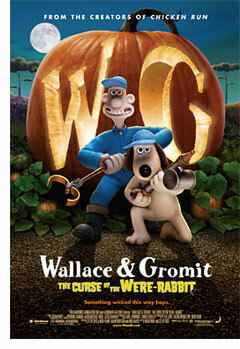 I’ve seen all of the Wallace and Gromit films and having just seen Wallace and Gromit: The Curse of the Were-Rabbit I must say it takes top honors for best execution. The film is simply outstanding in its quality and definately a step in the right direction for Ardman films. I’m having a difficult time deciding whether I like this movie best or The Wrong Trowsers. In The Wrong Trowsers a very cool penguin takes centerstage in an elaborate plot to rob a museum. While that film employs more subtle cues and less spoken word it still has a very, very good story. In this new film there are way more characters than ever before in an Ardman film and so it is just that much more action packed. The plot is simple: Wallace and Gromit live in a small English town where the annual Giant Vegetable Competition is held. Rabbits have infested the town and Wallace’s company Anti-Pesto is considered the best company to manage the pests in a humane way. Back at the home Wallace and Gromit keep all of the rabbits in the basement and feed them presumably until after the competition is over. I won’t go into details but the next bit is where the film really shines. 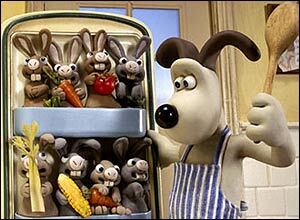 A giant rabbit starts terrorizing the gardens and eating the huge vegetables. There are some wonderful chase scenes and good character development at this point. There is even one scene where the giant rabbit climbs a building ala King Kong. One more interesting note: throughout the film I was expecting to see a nod to Jimmy Stewarts film Harvey in which a giant invisible rabbit is also the central character. I didn’t see it. Checking the Wikipedia however reveals this (now obvious) tidbit: A large carrot sign advertises “Harvey’s” vegetable shop, a play on the film Harvey. The article about this film on the Wikipedia. Yeah, as you can tell I rushed out right away to see it after your endorsement. Actually, I hadn’t planned to even see it until next week sometime and then Andrew said “let’s go watch W&G” and I was underwhelmed with a lot of things and so it was perfect. Great movie.